Safety nets should be replaced every two years. The harsh summer sun can weaken the net material and make it brittle over time. To ensure that your family is as safe as possible, replace your net in a timely manner. Safety foam should be replaced every two years. Safety pads should be replaced every three to four years. Safety foam is also greatly affected by the sun, and may not provide superior protection against the springs and the metal components after three years. Trampoline frames are the strongest components and will last the longest. The average trampoline frame lasts for about ten years before a replacement is needed. 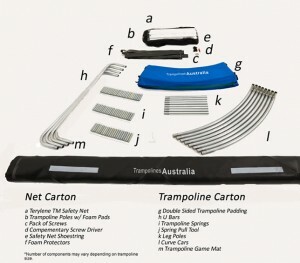 Although these suggestions can serve as a valuable guide, it is the buyer's responsibility to check all components for wear or damage before the trampoline is in use.